Don’t worry, Dad, I’m eating plenty of meat in China. Last Friday I went out for huoguo with a bunch of friends from the dorm. Huoguo literally means “fire pot” or, commonly known as “hot pot”. From left to right: Piper (a.ka. 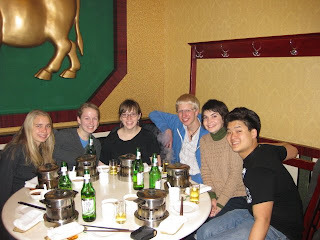 Shaopei), Katie (Kangtian, also my roomate), Jennifer (Yunzi), Oscar (Oule? He is from Norway! ), Me (Ruofei), and Nitt (Ande). It’s weird to be learning two names for everyone- it’s very easy to pick up people’s English names, of course, but we have to call them by their Chinese names so the professors don’t give us the evil eye. It’s so hard to remember Chinese names! We ordered raw meat (pork and mutton) that was cut into very, very thin slices and uncooked noodles and vegetables (lettuce, mushrooms). The waiters pour broth into your little pot and since it has some sterno under it, it quickly starts to boil. You cook the meat in the broth and then dip it in the peanut sauce. mmm. I’m sure this type of meal is not unfamiliar to many of you- we have this kind of ‘fondue’ at home. 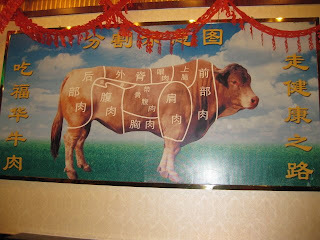 Excellent diagram of The Cow near the door. Very nice to meat you and your friends! Hope there were a few veggies and some noodles to go with all that pork and mutton!